"It is from the exquisite natural beauty of the world around us that the resources come to enable MONU to create unique, gentle and naturally pure beauty products. With such resources becoming ever more precious, it reinforces our commitment to setting new standards in ethical and environmental responsibilities." 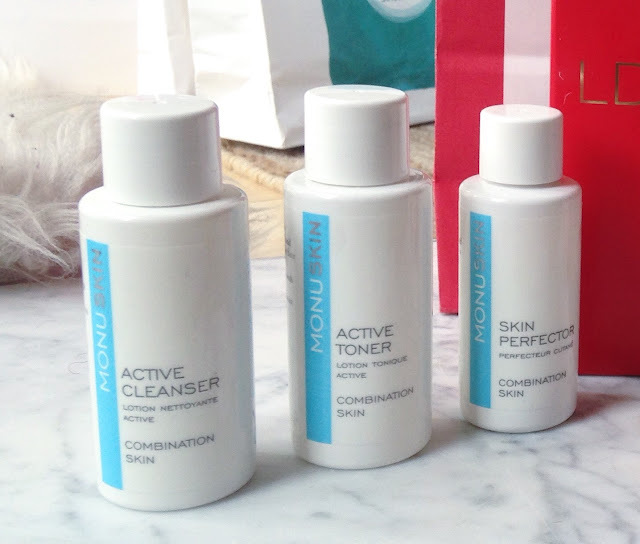 The MONU Skincare products are clean and simple in design. I received a trio of 50ml travel-sized bottles which I imagine will be great for holidays and short breaks. The white bottle feels clinical and professional; which I think is echoed by the product itself. None of the products smell flowery or sweet at all. They smell lightly of chemicals which gives an overall impression of a ‘prescribed’ product that will achieve great results. I personally love products that smell sweet and flowery, however, I am more trusting of products that don’t! I'm weird like that...! The packaging states that all the products are made “Using the best of nature” and with testing methods that are considerate to the environment and not on animals. I think this is great! Active Cleanser- The cleanser has a good consistency; it is not too runny or too thick. I found it is great to use after removing make up with a micellar water. Active Toner- My first ever toner! This is something I realise I really need to get into the habit of using as I have a few large pores on my forehead and next to my nose. I am hoping with even more use, this toner will help to close and tighten these pores. Skin Perfector- This moisturiser, like the cleanser, is really great in consistency. I used this moisturiser alongside Aloe Vera gel in my morning skincare routine. I wouldn't recommend using this moisturiser by itself in the morning as I found it wasn't giving my face enough moisture before applying make-up. I would either combine with another oil-free moisturiser or gel, or use a good primer. Brightening Boost- I have only used this product once as I am currently trying to clear my complexion and skin imperfections before ‘brightening’. This product smells nicer than the other three. It is also creamier and moisturising. It is to be applied before moisturising in the day and night. I can’t wait to give this a really thorough try and start taking steps towards make-up free days. I think after reading the information about Monu's 'Oily, Spot-Prone Skin' products, I would have been better suited to that range. However, the combination products have been great and I will continue to use alongside my other skincare products. You can read about all MONU skincare products on their website.